Google Drive is the newest reincarnation of Google Documents. Google Drive has sure come a long way. You may still recall the old Google Docs days of being a web based app on the iPhone. The Google Drive service and iPhone app upgrade adds a touch of Dropbox to enhance functionality and sharing–5 GB are free and upgrades to 25 GB available. To access, create, share, and edit documents on your Google Drive from your iOS device, you need to download the new Google Drive iPhone, iPod Touch, and iPad app. And not to worry, your current documents are available, when you upgrade. The Google Drive iOS app is nearly a mirror image of the website; the streamlined document creation capabilities are the main exception. After a quick sign in with your Google account, there is a bare bones list exactly like the list of selections on the left side of the screen on your computer. You can select from the following choices: My Drive, Shared with me, Starred, Recent, and Offline. Or, you can search from the home screen. From the list, you simply touch your preference, and a new list appears. You can scroll through the list, and, with a touch, check out the document. 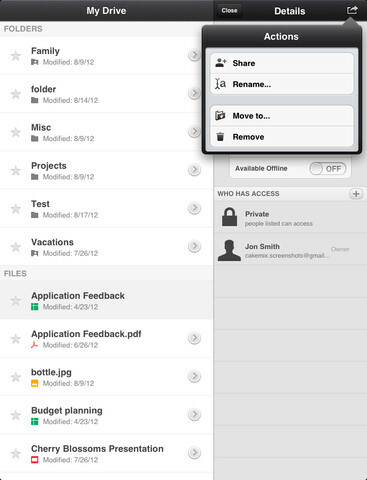 From each list of documents, you can add a document, folder, upload a video, or use the in-app camera. The in-app camera functions nicely. The upload time for a video on a wi-fi connection is comparable to a YouTube video. As I uploaded images, videos, and documents to my Google Drive, I was able to watch them sync quickly with Google Drive on my computer. I use Dropbox as well, but I typically don’t find the sync between devices to be nearly as quick as Google Drive. 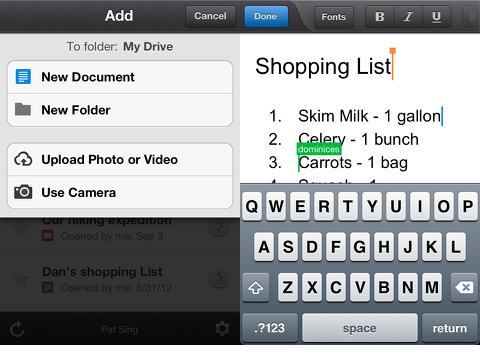 In order to create a document in the Google Drive iPhone app, the tools are smartly edited from the online version. There is an excellent tool bar at the top of the screen. The done icon is on the left with a lightly waved line separating the document creation features. On the right side of the waved line, tools and functions like font, bold, italic, list inserts, and justification are accessed by swiping your finger. The gesture controls are agile, responsive, and attractive, and the tools and functions operate efficiently. When you are finished, you can see it as a document. 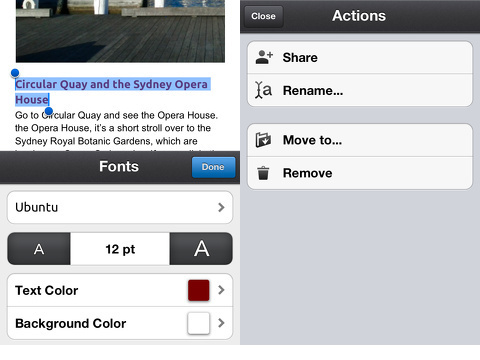 The interface for sharing a document is efficient as well. You can touch a document from the list, and you will find a brief snapshot including the title, opportunity to edit, make offline with one touch, and add users. The ability to edit and add users worked seamlessly from the Google Drive iPhone app. The Google Drive iPhone, iPod Touch, and iPad app is solid. It’s not a bright, flashy, or mold-breaking iOS productivity app, but it does its job effectively. AppSafari review of Google Drive was written by Jenni Ward on September 14th, 2012 and categorized under App Store, Files, Free, iPad apps, Productivity, Universal. Page viewed 6588 times, 1 so far today. Need help on using these apps? Please read the Help Page. This is another one of those essential app of the modern world. Great review!